It was a chicken. It was magic. Oscar’s Great-Granny showed him how to draw. Oscar was not good at drawing. But he loved art, so he kept the drawing of a red chicken that Great-Granny gave to him and he loved to look at it. He bought another drawing at a flea market, and he loved looking at that one, too. As he grew up, Oscar collected more drawings and paintings, filling his bedroom with color and shapes and scenes. Oscar collected and collected until a museum had to be built to hold all of his drawings and paintings. Not everyone can become an artist, but as Oscar learned, everyone can love looking at art. Oscar’s passion for the stories in paintings and the thoughts they provoke will inspire young readers to see art in a new way—even if they don’t enjoy making it themselves. Jan Wahl is the author of nearly one hundred books for young readers, including PLEASANT FIELDMOUSE and CANDY SHOP. He lives in Toledo, Ohio. When Rosalinde Bonnet was little, she couldn't decide if she wanted to be an artist, an illustrator, or a zoologist. Now she writes and illustrates children's books that often feature animals—like Poppy! She is the illustrator of The Art Collector and The Little Red Elf, and the author and illustrator of several picture books available in France, Belgium, and the United Kingdom. Oscar is very young when he watches Great-Granny take a red crayon to a blank sheet of paper and draw a chicken. Magic! Although his own efforts at drawing disappoint him, he enjoys looking at his great-grandmother's drawing, now framed and hanging on the wall. Soon Oscar buys an old etching at a flea market, and as he grows up, he continues to buy pictures that please him. After many years, Oscar's collection becomes famous, and a museum is built to house it. He keeps only one: the red chicken. Although conventional wisdom has it that a picture-book story should have a short time frame, this one spans a lifetime and succeeds in its own way. The quiet, simple text makes Oscar's passion for collecting pictures as understandable as another boy's love of baseball cards or action figures. Created with acrylic paint, pencil, and collage, the precisely drawn illustrations create pleasing views of Oscar's world. An unusual, potentially eye-opening picture book. A pure and simple appreciation of art—and of loving it. Oscar is both a tiny boy and an art collector. His first purchased piece is “an old etching” of a stream and waterwheel; he pulls weeds to afford its price—$1—and to replace the cracked glass and old frame. Sitting on his rocking horse, he gazes at the etching, never bored. Over time, he acquires portraits, still-lifes and landscapes, representational and abstract pieces, many paintings and at least one woodcut. He cherishes each one. Slightly older, he sits reading "Art News," bedroom walls covered in art; when he leaves for college, he carefully packs everything against breakage. 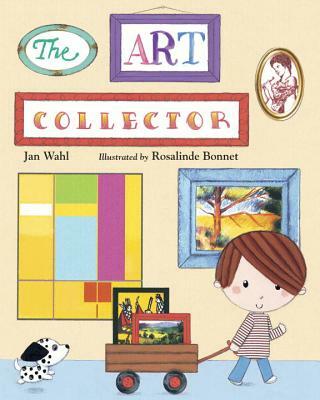 The collection grows “until a museum had to be built to hold it.” Readers will share Oscar’s enjoyment via Bonnet’s rendition of the pieces themselves, pleasurably variant in content and vibe, and via the calm cheerfulness of her illustrations. In acrylic paint, pencil and collage, she makes Oscar’s world still but alert, visually joyful but never cluttered. Some adults may cringe that Oscar’s original impetus to view art (rather than create it) is frustration at his own inability to draw representationally; however, it’s his admiration for Great-Granny’s chicken portrait in crayon (in contrast to his own) that spawns an admirable lifelong passion. Art needs fans and collectors as well as creators, and this will encourage some new ones. Wahl (Bear Dance) has a fresh suggestion: making art isn't the only way to enjoy it. Oscar falls in love with Great-Granny's drawing of a rooster, but can't make one as nice himself. "Oscar frowned. And he crumpled it up." Instead of learning to draw, Oscar becomes a connoisseur. He falls in love with an etching of an old mill at a flea market ("The etching cost one dollar. Oscar counted out coins and tugged at Pa. 'I must have it,' he said"), and by the time he's grown up, his collection is so big that "a museum had to be built to hold it." In Bonnet's (The Little Red Elf) crisp cartoon illustrations, Oscar, with his round head and rosy cheeks, is an appealing protagonist; larger spreads give readers lots to look at, as Wahl inspects Oscar's paintings one by one ("In a Japanese woodcut, a bamboo lute strummed"). In addition to the overarching theme about art appreciation, the book champions the idea that children may turn to serious work early in their lives. This quiet tale tells of a little boy's introduction to drawing and his maturation into a renowned art collector. Young Oscar first becomes enchanted with art when he is "very, very, very small" and observes his great-grandmother drawing a chicken. He tries his hand at drawing one, too, but is disappointed in the results. Great-Granny, however, congratulates him for his image done with chalk on black paper: "You have made a very fine picture of a snowstorm on a very dark night." At a flea market, the child purchases an old etching of a waterwheel. As he grows older, he collects more works of art in various styles until one day they fill a museum built especially to house them. Wahl's narrative lacks drama, but Oscar's story should appeal to sensitive children awakening to the glories of great art. Unnamed works in Oscar's collection pay homage to Japanese ukiyo-e, Mondrian, Pointillism, and so on. Bonnet's acrylic paint, pencil, and collage illustrations are as quiet as Wahl's writing-perhaps a missed opportunity to exploit the dramatic, emotional quality of Oscar's acquisitions-but not without a quirky charm. For example, Great-Granny stands out from the dress-wearing females in her cropped jeans and floral head scarf, and Oscar's mod parents are the picture of Parisian hipster style. A good choice to pair with a visit to the museum, this picture book will find a use in many collections.